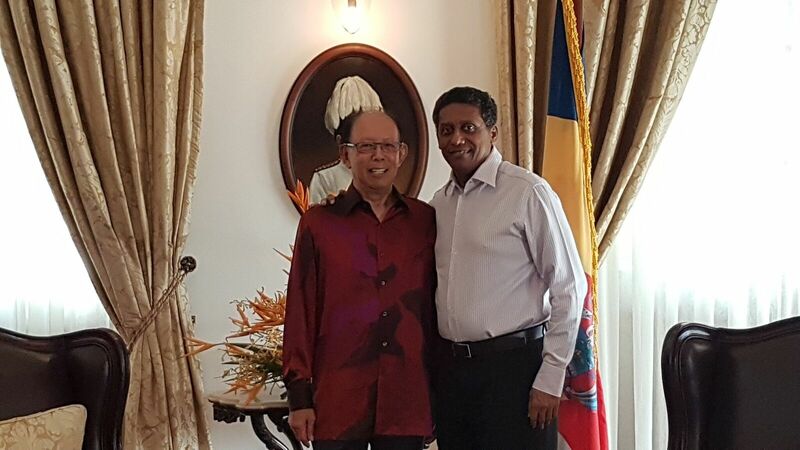 Victoria, Seychelles, 12 April 2017 – The Honourable Tun Musa Hitam, Chairman of the World Islamic Economic Forum (WIEF) Foundation extends an invitation to His Excellency Danny Faure, President of Republic of Seychelles to the upcoming 13th World Islamic Economic Forum (WIEF) at his office today. The visit to Seychelles, co-hosted by FORSEAA (Forum of Small Medium Enterprise Africa ASEAN), is in conjunction with the bi-annual WIEF International Advisory Panel (IAP) Meeting. The meeting brings together a group of influential individuals who are respectable business leaders, academia and community leaders to share their expertise in realising the vision and mission of the WIEF Foundation. The panel consists of 19 members from countries including United Arab Emirates, Morocco, Turkey, Germany, Indonesia, Bangladesh, Kenya, Malaysia, Pakistan, South Africa, India and Bahrain. The WIEF delegation was also given a briefing and a tour of tourist development projects in Seychelles including the Pangia Beach project, a high-end residential development of luxury apartments in Mahé. The 13th WIEF is scheduled to be held at the Borneo Convention Centre in Kuching, Sarawak, Malaysia from 21st to 23rd November, 2017. Themed ‘Disruptive Change: Impact and Challenges, the Forum will be jointly organised by the Sarawak State Government of Malaysia and the WIEF Foundation. Invited leaders include Xi Jinping, President of Republic of China, Joko Widodo, President of Republic of Indonesia, Sheikh Jaber Al-Mubarak Al-Hamad Al-Sabah, Prime Minister of State of Kuwait, Justin Trudeau, Prime Minister of Canada and Vladimir Putin, President of Russian Federation, Dr Yousef bin Ahmad Al-Othaimeen, Secretary General of Organisation of Islamic Cooperation, Dr Bandar Mohammed Hamzah Hajjar, President of Islamic Development Bank, Abdelilah Benkirane, Prime Minister of Kingdom of Morocco, Malcolm Turnbull, Prime Minister of Australia, Azali Assoumani, President of Union of Comoros and Pravind Kumar Jugnauth, Prime Minister of Republic of Mauritius. In 2016, the Forum was held in Jakarta, Indonesia. It was attended by 5 Heads of State, 12 ministers, over 300 press and more than 4,000 delegates from 73 countries.